Have visit VeryPDF website these days? Have you focused on the discount information about the bundle converters PDF to PowerPoint Converter+ PDF to Excel Conveter+ PDF to Word Converter? If not, please visit this homepage to see the detailed information about the coupon of VeryPDF. 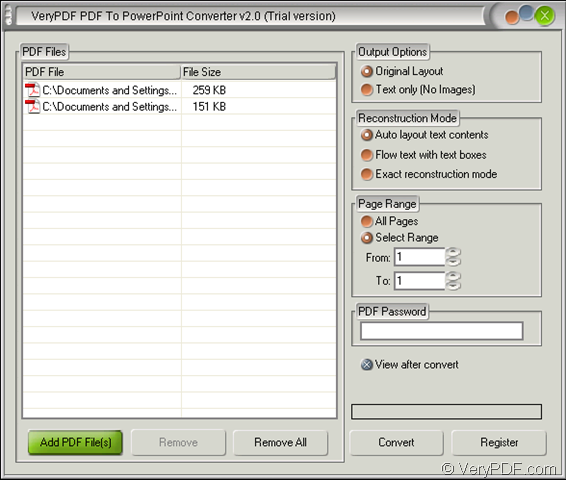 In the following contents, you will see the introduction about PDF to PowerPoint Converter. 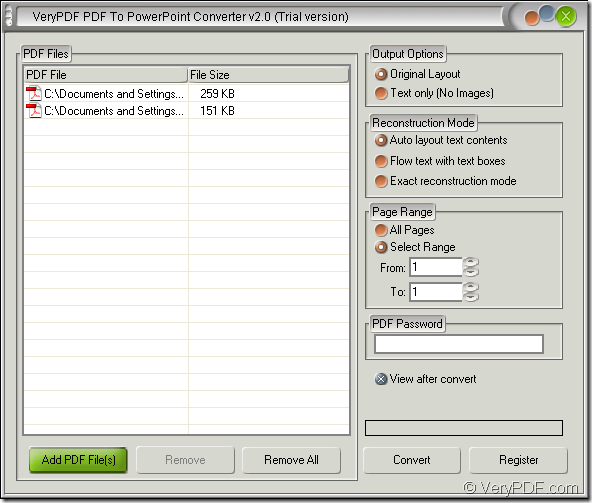 PDF to PowerPoint Converter is a special tool for converting pdf to powerpoint presentation file. It supports batch conversion that can convert multiple pdf files to ppt in one process. For using this application, please download it at first and then install on your computer. Please open the application at first and then you can see the interface of the application like the one shown in Figure 1. With drag and drop operations, you can easily add pdf documents into the application. This application supports batch conversion, so you can add a batch of pdf documents into the application to convert pdf to powerpoint in batch. In Output Options group box, you can choose the original layout or remove image. In Reconstruction Mode group box, there are three options for your choice to reconstruct the output layout. You can choose the page range for the converted document in Page Range group box. When you click Convert button, please save the target file in popup window. When the conversion from pdf to powerpoint is over, you can freely open the created ppt document in specified location. If you want to save money, you might as well visit the homepage to see these bundle converters. If you need to purchase them with $59.95 to save you $49.90 at one time, please click the following button. In addition, if you have any questions about the bundle converter, please contact our support team. This entry was posted in PDF to PowerPoint and tagged coupon, discount, PDF to PowerPoint, pdf to ppt, pdf to pptx. Bookmark the permalink. This looks like a cool software. We often struggle to share our slide design for PowerPoint and this could definitely help. I'll let the presentation designers know about it tonight.